Brazil’s vibrant culture is widely recognised all over the world. With its famous carnival and lively samba, it should come as no surprise that their food reflects this energetic spirit. Brazilian cuisine is especially exciting as it’s a combination of multiple influences: indigenous, European (mainly Portuguese and Spanish) and African. The sheer size of the country and its population means its cuisine can vary greatly regionally, but there are frequently staple foods easily available across Brazil that are incorporated nationally, providing a commonality. Ingredients like coconut, palm oil, lime and peanuts appear often across their food palette. Here’s our guide on what to eat in Brazil if you’re ever lucky enough to visit, or even try at home! Caipirinha - An easy cocktail to make if you’re looking to bring a Brazilian flair into your own household! Much like other tropical drinks, it uses a classic trinity that is found as a base in Margaritas, Mojitos and Daiquiri. This beverage has just three ingredients: cachaca (a Brazilian equivalent of rum), lime juice and sugar! A refreshing drink to get into to the Latin spirit. 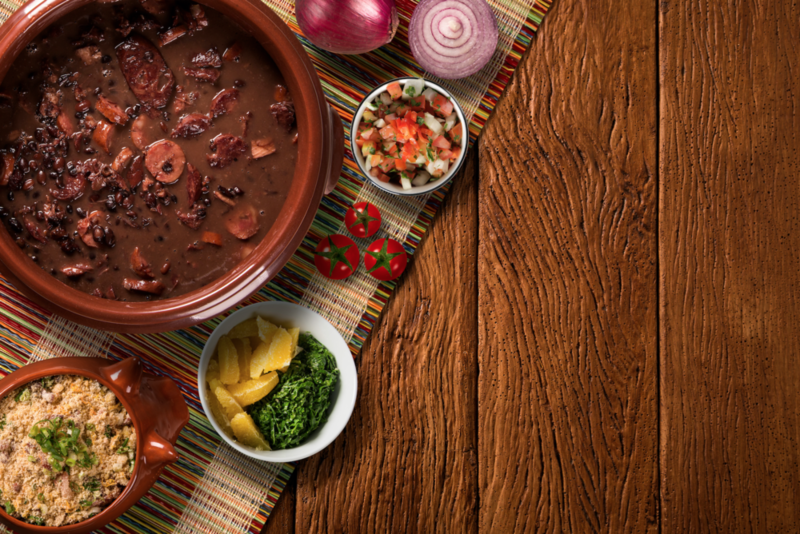 Feijoada - This is a hearty stew with black beans and smoked pork or beef as a base, from Portuguese origin. Served with rice, it is widely considered a national dish but the the precise recipe varies in different regions. Feijoada can have an array of other ingredients added, such as cabbage, kale, potatoes, carrots, okra, pumpkin, chayote and even banana. The stew tends to be cooked over a low heat in a thick clay pot. A labour of love, for best results it takes 24 hours to make, and is traditionally served on Wednesdays and Saturdays. Chicken Xim Xim - If you like Chicken Satay you are sure to love Chicken Xim Xim. It shares several base ingredients such as chicken (obviously) and peanuts, but then traditionally also has prawns, chilli and coconut milk. This dish is from African origin, in fact the name comes from an African word for ‘stew’. The combination of chicken and seafood may seem odd at first, but if you consider more westernised dishes it’s not unheard of, for instance Paella! Moqueca - In essence a fish stew, this exquisite dish contains various kinds of seafood, coconut milk, lime, tomatoes, onions, garlic, fresh cilantro and palm oil. Any country with a coastline has their signature seafood dish. In Peru they have the delicately delicious Ceviche. In the UK simple battered fish, chips and mushy peas. In France they have a fish stew called bouillabaisse. 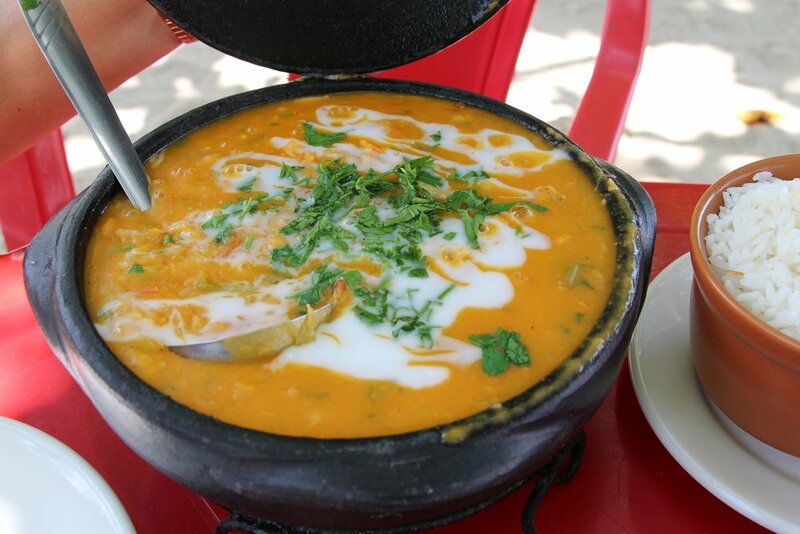 In Brazil, its Moqueca! Brigadeiros - The ultimate Brazilian party food resembles our chocolate truffles, but is adorned with sprinkles. A rich treat, made with condensed milk, cocoa powder, and butter, it is excessively rich and sweet. For more mature versions alcohol can be added into the mix, and sprinkles are often replaced with pistachio or almond flakes. Pão de queijo - Essentially cheese bread, this is a national delicacy. And good news for celiacs, the gluten intolerant and the health conscious, you don’t have to miss out as it’s gluten free! Instead of wheat, it is made with tapioca flour. Quindim - A set custard, much like a flan, made with eggs, sugar and ground coconut. This delectable dessert definitely has a Portuguese influence, and like many Brazilian treats is intensely sweet and dense. Feeling inspired? You can find recipes for a lot of these online, from top chef’s such as Jamie Oliver and Martha Stewart. Happy cooking (or just eating)!